1959 Simca Aronde Deluxe - Yesterday I featured a Simca that was sinking into the mud in Alaska. Here's one that's older, but in much, much better shape. 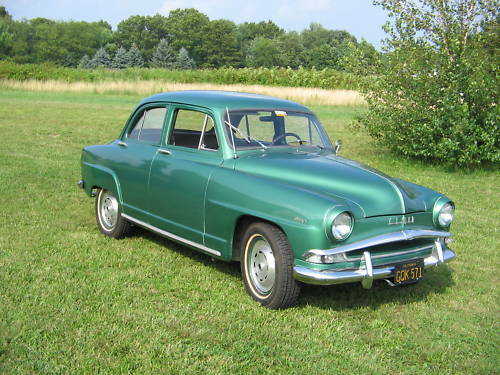 The Aronde was first introduced in 1951. It was Simca's first original design. Earlier cars were based on Fiat designs. This car has an almost American look to it. The engine is a 1290cc 4. The transmission is a 4 speed with a column mounted shifter. This is not a quick car, it takes over 25 seconds to reach 60. There may be more of these in the US than the newer 1204 I featured yesterday, but it's still a rare car and a cool piece of French automotive history. Located in Hookstown, PA, click here to see the eBay listing. 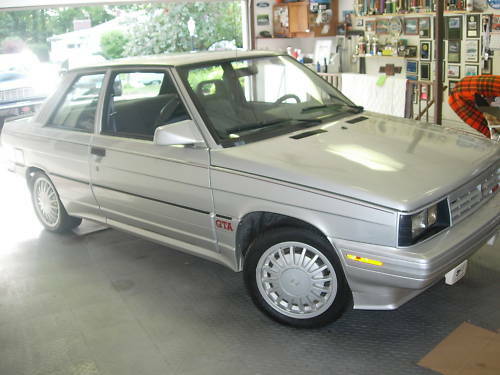 1987 Renault Alliance GTA - This is interesting. I wrote in an earlier post that the GTA is a "really fun car that no one really cares about". Maybe that's starting to change. The GTA was Renault's answer to the Volkswagen GTI. In some ways, especially handling, it was better than the GTI. I've driven one a few times and it was as fun to drive as many of the "real" sports cars I've driven. What let it down (besides the Renault name, which wasn't highly regarded in the US) was its build quality. It wasn't very well screwed together and some of its parts felt (and were) very cheap. This car is an 80,000 mile survivor. It's in good, but not perfect, condition. What makes this car interesting is the price. With over 4 days to go, it has already been bid up to $3000.00. That's real money for a GTA and the auction is not over. Maybe people are finally figuring out just how fun these cars are. Located in Torrington, CT, click here to see the eBay listing. 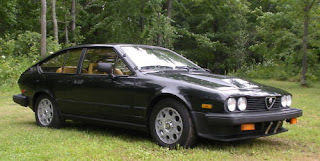 1985 Alfa Romeo GTV6 - In my mind there is nothing wrong with these cars. They have the great body of the Alfetta and the spectacular engine of the Milano. What's not to like? The biggest problem with them now is finding a decent one. Rust was a problem on these cars. Many just rusted away. Price was a problem, too. Not too long ago you could buy a GTV6 for next to nothing. Many people did. Many of those people had no business owning an Alfa. Lack of maintenance lead to many GTV6s self-destructing. This is a very nice original GTV6. The seller says it's rust free and it seems like its been well maintained. Being a 1985, it has the nicer front seats and available interior colors. Located in Aniwa, WI, click here to see the eBay listing. Regarding the Alfa GTV-6, don't know if you remember, but there used to be a guy who ran a huge Alfa salvage yard and repair facility in Wisconsin called Alfa Heaven. Happened to be in Aniwa WI. Same place this car is located. The guys name was Tom Zat, who was a bit of a character. He also built the only 164 wagon that ever existed AFAIK, by grafting the rear of a ford Taurus wagon (this was his wife's car and when she wiped out the front by hitting a deer, he got the idea) to the rear of the 164. Looked remarkably good. Don't know if there are any photos of it on the web anywhere, I know he took it to one or more of the AROC conventions. Anyway, Tom Zat kind of fell off the planet many years ago and divested himself of the Alfa business. The name of the guy selling this is Tom, and he's in the same town ... Hmm? I actually visited his place once many years ago. He had an amazing collection of stuff including an Alfetta sedan that had been cut in half by Alfa which was used in promo photos and was used at shows to show some of the innovovations in the cars. Also, the listing for this car says it has power steering. These cars did not have power steering, but retrofitting a rack and pump from a Milano is an easy, common and worthwhile upgrade. I miss my GTV-6, when everything is 'right' in these cars, they are amazing.